Did the man of the match come from these players? Jamie Jones: 8 - No chance with the goal but some excellent saves and another very solid case for keeping hold of the gloves. Nathan Byrne: 7 - Welcome run in the side and involved in some neat triangles down the right with Pilkington and Windass. Chey Dunkley: 8 - Preferred alongside Fox and justified the manager’s faith by standing up strong against everything the Millers had to offer. Danny Fox: 6 - Started well before being poleaxed. Happily was able to watch the second half from the bench despite a number of stitches in mouth. Kal Naismith: 6 - More defending to do than usual but stuck to his task and produced a fine headed clearance late on. 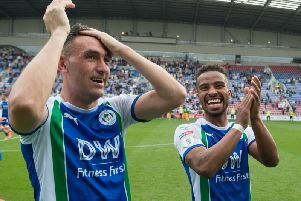 Beni Banginime: 6 - Tough baptism of fire on debut - a million miles away from the Premier League - but, as Paul Cook said, grew into the game. Reece James: 8 - Will have learned more from this than from most games this season, but more than held his own and looks a class apart. Anthony Pilkington: 7 - Touch of a Premier League player, and involved in much of what Latics did well going forward. Josh Windass: 7 - Lively display and third goal in as many games, growing into the attacking role vacated by Will Grigg. Michael Jacobs: 7 - Great to see him back from injury and to his best, tireless display and mucked in defensively too. Leon Clarke: 6 - Might have done better with his only chance but battled hard on a tough afternoon ploughing the lone furrow. Cedric Kipre: 7 - Squeezed out of the starting XI but given a swift reprieve and slotted back in with the minimum of fuss. Gavin Massey: Great to see him back out there for the few seconds he was. Subs not used: Christian Walton, Jonas Olsson, Callum McManaman, Gary Roberts, Joe Garner. Rotherham (4-1-4-1): Rodak; Jones, Wood, Robertson, Mattock; Ajayi; Taylor, Vaulks, Crooks, Forde; Smith. Subs: Vyner, Price, Towell (for Crooks, 79), Ihiekwe, Yates, Newell (for Taylor, 69), Wiles.